Throughout the 1890’s the Keystone View Company, founded in Pennsylvania by Benneville Lloyd Singley (1864-1938), produced a steady stream of stereoviews, but nothing in comparison to its prodigious output in the coming decades. 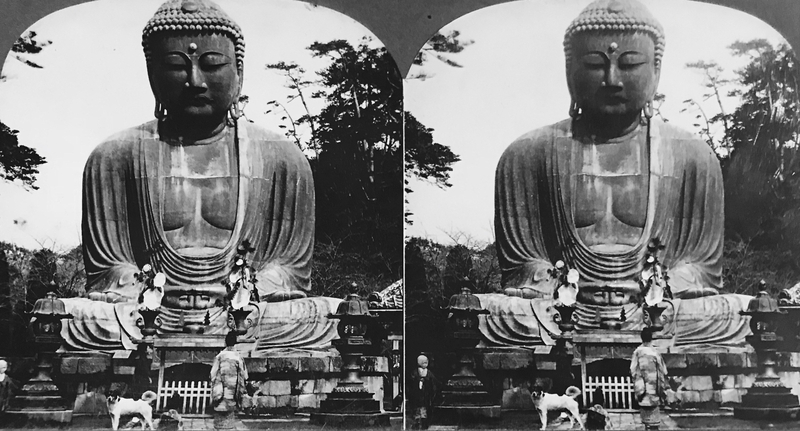 Around 1901, Keystone issued its first images of Japan, a run of 23 odd-lot stereoviews taken by an unknown photographer. Even though Singley’s name is imprinted on the mounts as copyright holder, he is not believed to be the photographer of the small series of Japan views. The publishing and distributing arm of Keyston in London, operating under the name of Fine Art Photographer’s Publishing Company, also issued the same Japan series on a buff-tan colored mounts through 1905. In response to the popularity of the boxed sets dedicated to Japan offered by competitors C.H. Graves, H.C. White, and the Underwoods, Keystone debuted its own “Tour of Japan” sets in 1906, comprised of the original 23 views supplemented by new images taken during the Russo-Japan War of 1904-5. Even though Keystone was relatively late to the Japan-view market, by 1921 it had acquired the negative stocks of all its main competitors, and it emerged as the sole prolific publisher of Japan-view box sets, mostly drawing upon its massive portfolio of images taken more than a decade earlier, between 1896 and 1906. Title/Caption: “Daibutsu” – The Colossal Bronze Statue of Buddha, Kamakura, Japan. In the first Keystone release of the bronze colossus, the Daibutsu dominates the image. The top of its head is clipped by the frame, giving the impression that the statue it too large to behold. Similar to the Strohmeyer image, our anonymous photographer places two well-groomed Japanese women in the foreground, cropped at the feet and waist, providing a sense of scale for the towering statue. Wearing lushly patterned garments and coiffured hair, the women appear more cosmopolitan than their rustic setting might suggest and their conspicuous presence hints at the hypersexual motifs flowing through Orientalist discourse. The formality of the composition is offset by two elements; the presence of a dog looking back at the viewer, and the positioning of a child on the far left, gazing towards the dog. These mundane elements clash with the distinctive, orchestrated dress of the women and overall diminish the sense that viewer is looking at a scene of pious activity. By virtue of its sheer size occupying most of the frame, the Daibutsu is given the most visual weight, and consequently the onlookers are relegated to secondary importance. Noting its “colossal” size, the caption gives literary form to the numerous visual cues asking the viewer to appreciate the aesthetics of the statue over its religious meaning to the worshippers. Moreover, the description on the reverse immediately situates the Daibutsu among the greatest works of world art, claiming it is “the masterpiece of Japanese statuary,” and “one of the great art creations of all time.” This is immediately followed by a poetic verse taken from an Alfred Lord Tennyson poem, In Memoriam: “A statue solid-set, and moulded in colossal calm.” Strikingly in line with many contemporary descriptions of the Daibutsu (the original context for the lines, however, is overcoming loss and regret), this quote provides a lyrical force to the aesthetics of the statue. This then dovetails into a gloss description of Buddhism, where another quoted passage describes the beauty and majesty of the Daibutsu as a symbol for the profundity and power of the Buddhist religion as a whole (as was typical, the Daibutsu was mistaken for the historical founder of the tradition). Interestingly, the Tennyson quote and the astute characterization was not pulled from a scholarly reference, but Murray’s “red book” travel guide, authored by no less eminent authority than Basil Hall Chamberlain (1850-1935). Keystone also issued a tinted glass magic lantern slide of one-half of the stereostopic image. The framing and black masking covers the woman, thus allowing the viewer to focus on the statue, sitting in a light blue tinted sky. At the same time, the sheer “colossal” size of the Daibutsu is also obscured by lack of a reference point. Along with stereoviews, magic lantern slides were a popular form of visual media at the turn of the century and both were packaged as valuable educational materials. First marketed to schools by Underwood & Underwood, Ketsone started their educational department in 1905 and is often considered part of the early visual instruction movement in America. Moreso than the stereograph, the lantern slide was made meaningful through performance, namely the lecture that would often accompany the visual images. Title/Caption: “Daibutsu” – The Colossal Bronze Statue of Budda [sic], Kamakura Japan. *This is part of a series of posts devoted to exploring the development of a visual literacy for Buddhist imagery in American mass media. All items are part of my personal collection of American Buddhist ephemera. For more detailed information on the Keystone Company, see Bennett 2006. Ponting also regularly clipped the head of the Daibutsu in framing his shot, though for the different effect of including Japanese worshippers in the foreground. Chamberlain had significantly enlarged the original edition by Ernest Satow, but only added the Tennyson quote in the 5th edition, published in 1898, see A Handbook for Travellers in Japan, 5th ed., pp. 96-7.
. For more on this interesting point see Dellmann, Sarah. “Getting to Know th eDutch: Magic Lantern Slides as Traces of Intermedial Performance Practices,” in Performing New Media: 1895-1915, eds. Kaveh Askari, Scott Curtis, Frank Gray, Louis Pelletier, Tami Williams, and Joshua Yumibe, New Barnet: John Libby Publishing, pp. 236-244.